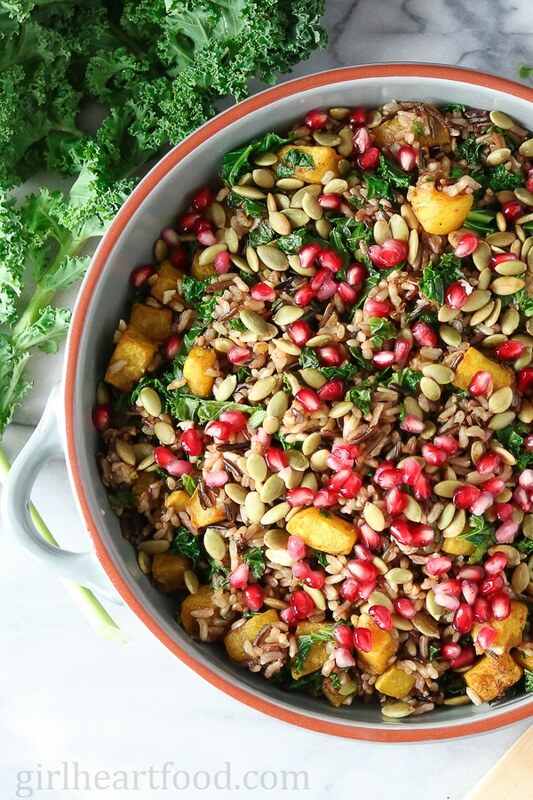 Top-10 fall-inspired Vegan Salads perfect for your Thanksgiving or Christmas dinner party. 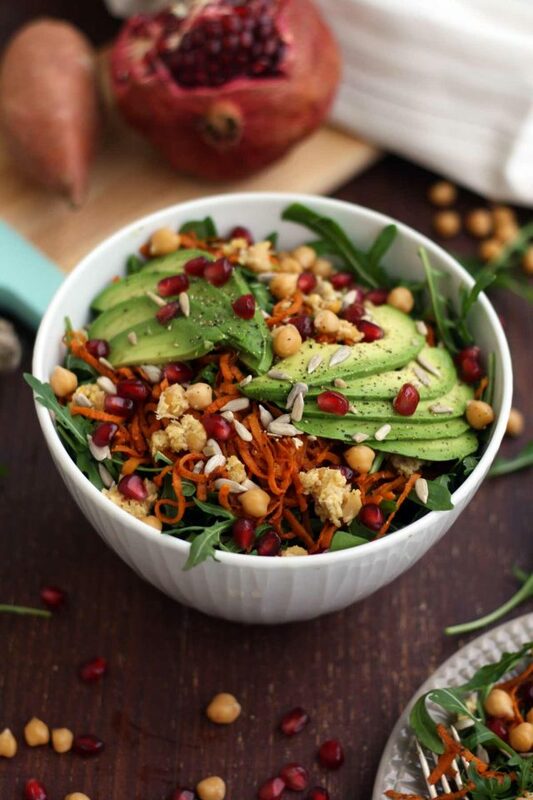 Impress your guests with these beautiful and delicious vegan salads that are easy to make! Pumpkin, kale, apples, sweet potatoes, Brussels sprouts… Fall produce is created for wholesome harvest salads. 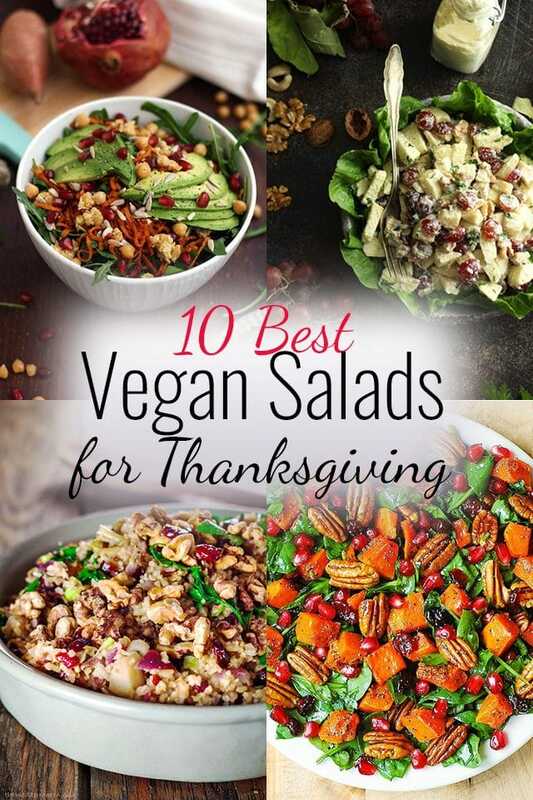 These 10 delicious vegan salads for your Thanksgiving table are guaranteed to impress your guests (especially non-vegans)! If you haven’t already, check my 10 best vegan appetizers for Thanksgiving! I’m creating a series of posts for your vegan Thanksgiving menu, including soups, main courses, stuffing, sides, condiments, desserts. Stay tuned for more awesome vegan holiday dishes! How do I replace turkey? What about the gravy? Will my guests love that? You don’t have to worry about these things any more. I selected the best vegan recipes that are truly DELICIOUS. Your no-vegan guests will beg for more! Choose the recipes you like from each category. They are all healthy, easy to make and yet delicious and perfect for your holiday menu. Here are the best fall salads from my fellow bloggers. Which one would you like to include in your Thanksgiving menu? 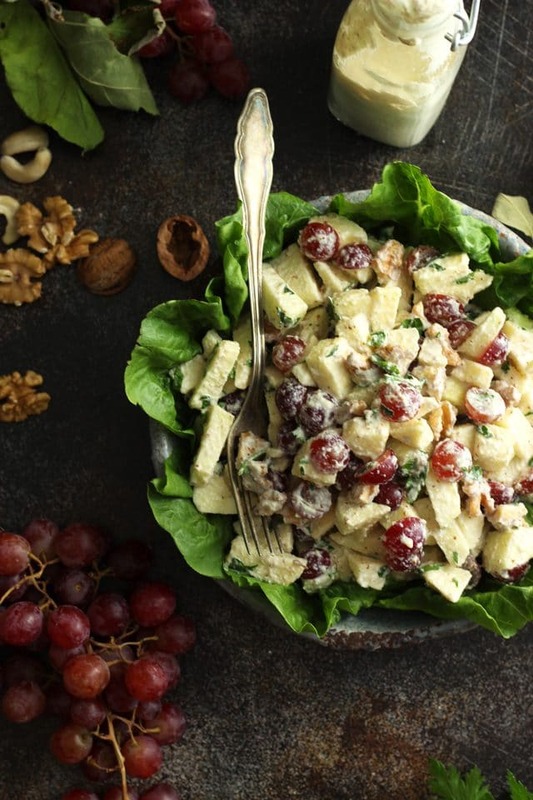 This healthy Waldorf salad is a vegan take on the classic Waldorf salad. Deliciously creamy apple cider vinegar dressing is used instead of mayonnaise for a lighter and fresher version. Perfect for your holiday vegan menu! 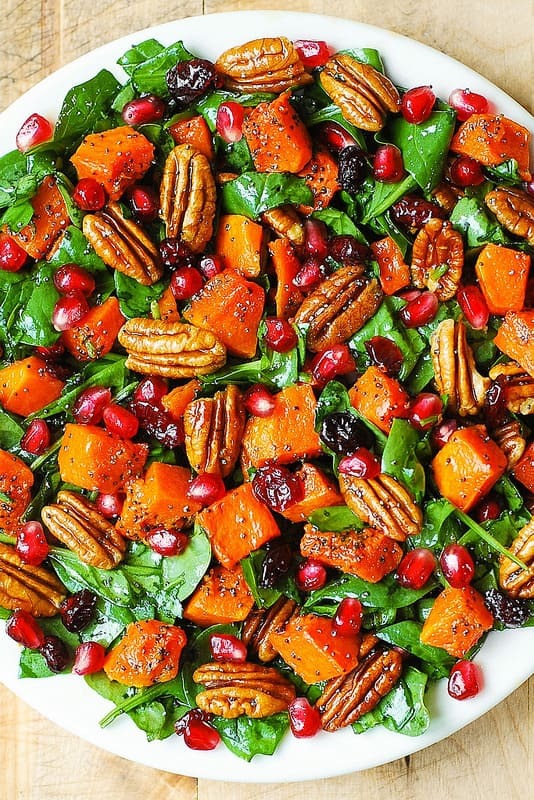 Butternut Squash and Spinach Salad with Pecans, Cranberries, Pomegranate with Poppy Seed Honey-Lime Dressing – a great choice for Thanksgiving, Christmas, New Year’s Eve or any other winter holiday menu! Healthy, easy and delicious vegan Sweet Potato Noodle Salad with Chickpeas and Rocket recipe. It makes for a great nutritious lunch or a nice gluten free side dish! 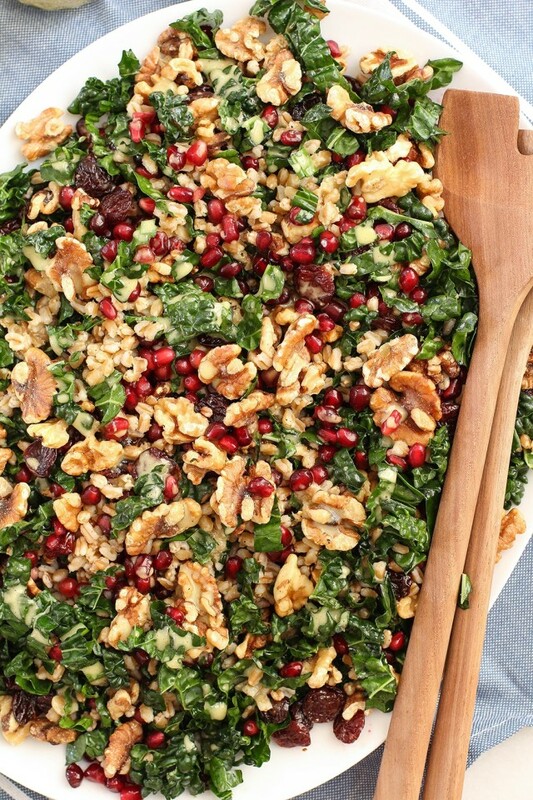 Packed with hearty lacinato kale, chewy whole grain farro, toasty walnuts, sweet pomegranate seeds, and tart dried cherries, there’s so much autumnal vibed stuff going on here. Add lemon oregano vinaigrette and you’ve got one heck of a satisfying salad. Stay tuned for more recipe collections including vegan appetizers, soups, main courses, stuffing, side dishes, potato dishes, breads, condiments, desserts. The whole vegan Thanksgiving menu! I hope you find the perfect vegan salad in this recipe collection. Which one do you like the most? Thanks you so much for including my harvest wild rice salad in this delicious round up! So many delicious salads for Thanksgiving and any special occasion 🙂 Have a wonderful weekend!